Conversion to Christianity is a process of religious conversion in which a previously non-Christian person converts to Christianity. Converts to Christianity typically make a vow of repentance from past sins, accept Jesus as their Savior and vow to follow his teachings as found in the New Testament. Different sects of Christianity may perform various different kinds of rituals or ceremonies on a convert in order to initiate them into a community of believers. The most commonly accepted ritual of conversion in Christianity is through baptism, but this isn't universally accepted among Christian denominations. A period of instruction and study almost always ensues before a person is formally converted into Christianity, but the length of this period varies, sometimes as short as a few weeks and possibly less, and other times, up to as long as a year or possibly more. Most mainline Christian denominations will accept conversion into other denominations as valid, so long as a baptism with water in the name of the Trinity took place, but some may accept a simple profession of faith in Jesus as Lord as being all that was needed for true conversion. Other Christians may not accept conversions performed in other denominations and certain communities may be discriminated against as heretical. This is most true for many nontrinitarian sects, which many mainstream Christian denominations (Catholic, Orthodox, and Protestant) reject as having valid forms of conversion. Consequently, many nontrinitarian sects spiritually isolate themselves in that they may only consider their conversions valid and not those of mainstream Christianity. Social scientists have shown great interest in the Christian conversion as a religious experience that believers describe as strengthening their faith and changing their lives. Christianization, defined as the "reformulation of social relations, cultural meanings, and personal experience in terms of (commonly accepted or supposed) Christian ideals," should be distinguished from conversion. Christianization is the broader cultural term, and typically has involved efforts to systematically convert an entire continent or culture from existing beliefs to Christianity. Christian denominations vary on the exact procedures of conversion. More traditional Christian groups such as the Catholic Church, the Orthodox Church, Lutherans, Anglicans, Methodists, and some Reformed Christians consider the sacrament of baptism in the name of the Trinity to be the moment of conversion. All of these groups teach the doctrine of baptismal regeneration, that is, once baptized, all past sins, including original sin, are washed away and a person becomes justified before God. Through baptism, one is incorporated into the body of believers, called the Church, and may rightly be considered a Christian. Some of these groups may also administer other sacraments in the process of conversion such as confirmation. Some Evangelical Christians, like Baptist, and Pentecostals, do not believe baptism is necessary for salvation and conversion, but only that a profession of faith is enough. Christians also differ on how old someone must be to convert. More traditional groups of Christians believe conversion is not restricted to age, and tend to baptize infants. Evangelical Christians do not baptize children because they see conversion as a deeply personal decision. Conversion has been used as a tool by imperial powers during the peak of slave trade & colonization of Asia & Africa. Even today it remains to be one of the greatest causes for social conflict in many countries. Before conversion takes place, converts, also called "catechumens", must undergo a period of instruction. In the Catholic Church, this usually involves spending a few months preparing in RCIA (Rite of Christian Initiation of Adults), where catechumens spend time learning about the Christian faith and the teachings of the Bible and the Church. In the Orthodox Church, it can take up to a full year of studying and participation before one is baptized. Protestant denominations and other Christian groups have various other ways of instructing converts which may focus heavily on the Bible. There are different modes of baptism in Christianity, these include immersion, affusion (pouring), and aspersion (sprinkling). The way in which a person is baptized depends on the denomination one enters. Almost all baptisms share in common the use of the Trinitarain formula (in the name of the Father, Son, and Holy Spirit) by the minister while baptizing the convert. The Roman Catholic Church primarily baptizes with affusion but occasionally does so with immersion. Orthodox Christians and some Eastern Catholics baptize by triple immersion upon invocation of the Trinity; the only time the Orthodox Church permits other forms of baptism is in the case of an emergency. Protestants baptize in a number of different ways. Many Anglicans and Lutherans baptize by affusion, whereas Presbyterians and Congregationalist typically baptize with aspersion. Others, like Methodist, may conduct all three forms of baptism. Many Evangelical Protestants insist that only full immersion baptism is valid, they base this off of the New Testament Greek word for baptism "baptizo" (βαπτίζω) which can be translated as "dipping" or "submersion." Baptism of a child by affusion. Depending on which of these denominations one enters, the sacrament of Confirmation, also known as Chrismation by eastern Christians, may be immediately administered after the baptism. In the Latin Catholic Church, infants who are baptized are not confirmed, but instead must wait until they're in their teens to be confirmed. In the Eastern Orthodox Church, and many Eastern Catholic Churches, infants are Chrismated and communed by a priest or bishop immediately after they are baptized. When an adult convert enters the Catholic or Orthodox Church, they are immediately confirmed after baptism, upon which, a clergy member will anoint the forehead with olive oil (or in the case of Byzantine Christians, the forehead, eyes, nostrils, mouth, ears, breast, hands, and feet), calling upon the Holy Spirit to seal the convert with his gifts. After confirmation ensues, the convert is invited to partake of first communion. These rites usually occur on Easter Vigil. Persons who convert to most mainline Protestant groups will be received via baptism and be initiated further by any traditions the particular denomination holds to. Oneness Pentecostals baptize converts by full immersion in the name of Jesus alone, a departure from the usual form of baptism. They base this off of certain passages found in the Acts of the Apostles. Unlike most Pentecostals, Oneness Pentecostals believe baptism is necessary for salvation. 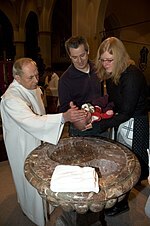 Although, they do not baptize infants, stressing that conversion is a personal decision. The Church of Jesus Christ of Latter-day Saints (LDS Church) teach that baptism is the first sacrament, called an ordinance in LDS theology, following conversion and is required for membership in the LDS Church. Baptism, according to the LDS theology, requires that the convert be accountable (credobaptism), that it be by immersion, and that it be performed by an authorized priesthood holder. As the LDS Church does not recognize the priesthood authority of other churches, all converts, even those from other Christian denominations, are required to be baptized. Following baptism, a convert is confirmed a member of the LDS Church and receives the Gift of the Holy Ghost by the laying on of hands of a Melchizedek Priesthood holder. This may be expressed at some Evangelical church services where the Pastor may conduct an "altar call", inviting non-Christian persons to go up publicly and "receive" Jesus into their hearts to become Christian. As a result of this belief, many Evangelicals do not practice infant baptism and from this they profess one must be able to make the decision on their own to convert to Christianity. Nevertheless, Evangelicals do practice baptism, but it is seen as a simple public pronouncement of faith in Christ rather than a means of grace. In Lutheranism, conversion or regeneration in the strict sense of the term is the work of divine grace and power by which man, born of the flesh, and void of all power to think, to will, or to do any good thing, and dead in sin is, through the gospel and holy baptism, taken from a state of sin and wrath and spiritual death into a state of spiritual life of faith and grace, rendered able to will and to do what is spiritually good and, especially, made actually to accept the benefits of the redemption which is in Christ Jesus. Most denominations accept one's baptism performed by another denomination. Nearly always, the baptism must have been with water and performed in the name of the Trinity. Such converts are usually received by a formal rite which normally also includes taking communion in the denomination and possibly being confirmed. The term used to describe the similarity of belief necessary for acceptance of a baptism under a different denomination is called "Like Faith and Practice." Some have codified this as "Right Method, Right Medium, Right Meaning." The Catholic Church considers all forms of baptism with water, including full immersion, affusion, and aspersion, that are done in the name of the Trinity as valid. Protestants (Lutherans, Anglicans, Presbyterians, Baptists, Assemblies of God, Methodists, etc.) who convert to Catholicism are usually not baptized, but instead are asked to make a simple profession of faith at Mass on an ordinary Sunday. Confirmation usually follows (though not always), and the convert proceeds to receive first communion. Eastern Christians (Eastern Orthodox, Oriental Orthodox, and Assyrians), are only asked to make a simple profession of faith and then begin participation in the Eucharist without having to be confirmed due to the Catholic Church recognizing eastern Christian sacraments. Eastern Christians who convert to the Catholic Church are automatically enrolled into the eastern rite corresponding to the Church they originated from regardless of what sui juris Church they entered the Catholic Church through. The amount of instruction before reception varies depending on how active the person has been in their Christian life, and how informed they are about the faith. Validly baptized persons coming from previous denominations do not have to be enrolled in RCIA because the Church does not consider them catechumens since their baptism has already made them Christians. Private instructions may be given by a priest, which can last from a few weeks to a few months at most. After instructions have ensued, the person may be asked to pick a sponsor for confirmation if the pastor decides to perform the sacrament. Mormons, Jehovah's Witnesses, Oneness Pentecostals, Christadelphians, Christian Scientist, and other groups who hold to nontrinitarianism and/or who do not baptize in the "proper" Trinitarian formula are received into the Catholic Church through baptism due to the Catholic Church not recognizing nontrinitarian baptisms. Quakers and members of the Salvation Army are also baptized because neither church practices baptism. Converts into any of the Eastern Catholic Churches, 23 sui juris Churches in full communion with the Bishop of Rome, are usually received by the traditions of that particular Church. In the Eastern Orthodox Church there are different opinions held by bishops and theologians on how to receive Christians coming from other denominations. Some will only accept Orthodox baptism done by triple immersion, and thus will rebaptize all converts. Generally, most jurisdictions will accept baptism done in another denomination by economy, as long as it has been done with water in the name of the Trinity; this is the position held by the Ecumenical Patriarchate of Constantinople. Most converts from other Christian denominations with baptisms in the Trinitarian formula (Catholics, Protestants, Oriental Orthodox, Assyrians) are received by chrismation and a profession of faith, or, in the cases of some Catholics and Non-Chalcedonian Christians, be received during confession as their chrismation (confirmation) in their former Church would be deemed valid. Protestant confirmation is not deemed valid by the Orthodox Church. Some Eastern Orthodox groups, such as the Russian Orthodox Church Outside of Russia (ROCOR), a semi-autonomous part of the Russian Orthodox Church since 2007, chooses to rebaptize all converts to Orthodoxy including Protestants and Catholics as well as most Oriental Orthodox. Since ROCOR is a fully canonical part of the Eastern Orthodox Church, Orthodox Christians who converted from another Christian denomination without being baptized again, but were received simply by chrismation or confession in their respective jurisdiction, are still communed by ROCOR clergy since Orthodox are not to doubt the validity of someone's conversion to the Orthodox faith. It should be noted that the Orthodox Church baptizes all Christians coming from nontrinitarian denominations because the Orthodox Church does not consider nontrinitarian baptisms as valid. Oriental Orthodox reception of converts from other Christian denominations varies greatly. The Coptic Orthodox Church accepts all baptisms done in the Eastern Orthodox Church, and since April 2017, accepts those baptisms done in the Roman Catholic Church. The Armenian Apostolic, the Syriac Orthodox Church, and the Malankara Orthodox Church are generally willing to accept any baptism done with water in the name of the Trinity. Most mainline Protestant groups hold that baptism performed with water in the name of the Trinity is valid and will accept converts who had been baptized within a previous Christian denominations in accordance with their particular customs. Some Evangelical groups like Baptists and Pentecostals do not consider baptism done by sprinkling or pouring as valid and might rebaptize a convert from another denomination by full immersion. Mormons do not recognize baptisms done in Christian denominations and will rebaptize using the Trinitarian formula (although they reject the orthodox doctrine of the Trinity) and confirm converts. Oneness Pentecostals only accept baptism done in the name of Jesus, and subsequently, baptize converts from previous denominations who were not previously baptized in this particular formula. Jehovah's Witnesses baptize all converts including those already baptized in previous denominations. As Luke tells the story, it was the miraculous catch of fish that awakened Peter's consciousness to an awareness that there was more to Jesus than meets the eye. Peter found himself in the presence of someone or something which elicited from him that most natural of all gestures of awe, reverence, and holy fear—he fell on his knees. This gesture was accompanied by a confession of his own wretched condition: "Leave me, Lord; I am a sinful man". [Lk 5:9] Once again, however, this insight is incomplete. Immediately a new life, a new direction is held out to Peter. "Do not be afraid; from now on it is men you will catch". [5:11] And Peter followed Jesus, leaving everything behind. The Gospels speak of the coming of the Kingdom with power from on high and while Jesus was alive on earth he was still under the Jewish Law being obedient to its rules and regulations. Jesus though was given all authority in heaven and on earth, even the authority to forgive sins which before only God could do. While alive on the cross he did forgive the thief who asked him because he had that authority. In Matthew 28:19-20, Jesus' last command was for his disciples to go and make disciples of all nations, baptizing them in the name of the Father and of the Son and of the Holy Spirit, and teaching them to obey everything he had commanded. Another dramatic conversion to Christianity occurred in the life of the Apostle Paul[Acts 9] whose formal name had been Saul of Tarsus. He was a zealot for the cause of Second Temple Judaism who had been "breathing threats and murder against the disciples of the Lord". [Acts 9:1] While traveling to Damascus to arrest Jewish Christians, he fell to the ground upon being surrounded by a bright light "from heaven". He heard a voice accusing him: "Saul, Saul, why are you persecuting me? "[9:4] The experience rendered him temporarily blind. The voice directed him to go on to Damascus where he was cured and baptized by Ananias of Damascus, was described as being filled with the Holy Spirit, and began to passionately proclaim the Christian gospel (good news). Hanigan perceives a common "death and rebirth" experience in these and other conversions which he describes as "encounters with the living God". His analysis is that these individuals responded not so much out of a sense of guilt, but from their awe, reverence, and holy fear of God's presence. The pattern, he writes, begins with God taking initiative in the individual's life. Then, the person responds by acknowledging and confessing personal lostness and sinfulness, and then accepting a call to holiness. ^ Can.854 Baptism is to be conferred either by immersion or by pouring; the prescripts of the conference of bishops are to be observed. ^ We are commanded to baptize by threefold immersion in water, in the name of the Holy Trinity. The Scriptures and the writings of the church affirm this. ^ United States Conference of Catholic Bishops, Rite of Christian Initiations of Adults: "After the Baptism the newly baptized are dressed in white garments and presented with a candle lighted from the Paschal Candle. They are then Confirmed by the priest or bishop who lays hands on their heads, and invokes the outpouring of the Holy Spirit. He then anoints them with the oil called Sacred Chrism. The Mass continues with the newly baptized participating in the general intercessions and in bringing gifts to the altar. At Communion, the newly baptized receive the Eucharist, Christ's Body and Blood, for the first time." ^ Catechism of the Catholic Church 1256, "The ordinary ministers of Baptism are the bishop and priest and, in the Latin Church, also the deacon.57 In case of necessity, anyone, even a non-baptized person, with the required intention, can baptize58 , by using the Trinitarian baptismal formula. The intention required is to will to do what the Church does when she baptizes. The Church finds the reason for this possibility in the universal saving will of God and the necessity of Baptism for salvation.59"
^ Code of Canon Law, Part I, Baptism, Chapter III:"Those baptized in a non-Catholic ecclesial community must not be baptized conditionally unless, after an examination of the matter and the form of the words used in the conferral of baptism and a consideration of the intention of the baptized adult and the minister of the baptism, a serious reason exists to doubt the validity of the baptism." ^ UNITATIS REDINTEGRATIO, Chapter III: CHURCHES AND ECCLESIAL COMMUNITIES SEPARATED FROM THE ROMAN APOSTOLIC SEE; "These [Eastern] Churches, although separated from us, possess true sacraments, above all by apostolic succession, the priesthood and the Eucharist, whereby they are linked with us in closest intimacy. Therefore some worship in common (communicatio in sacris), given suitable circumstances and the approval of Church authority, is not only possible but to be encouraged." ^ 1990 Code of Canons of Oriental Churches, Canon 35; "Baptized non-Catholics coming into full communion with the Catholic Church should retain and practice their own rite everywhere in the world and should observe it as much as humanly possible. Thus, they are to be enrolled in the Church sui iuris of the same rite with due regard for the right of approaching the Apostolic See in special cases of persons, communities or regions."